The calendars of our lives become checkered over time, marked by anniversaries of wonderful joys or terrible sorrows. A certain day, once just another measure of 24-hours is ever-after associated with the thing that happened. May 1st is such a day for me. It was ten years ago on a cloudless, strangely bright morning, that I found my husband dead. This year, May 1st was shrouded in fog and I was glad for one less trigger. Grieving after suicide is complex. Rarely do people kill themselves completely out of the blue. Addiction and depression lived with us in our little house for years. After his death, mixed in with my shock, anger and anguish was also profound relief. “It’s over.” I said to myself even as I doubled-over in sobs as the policeman confirmed what I knew – that he was gone. My daughter and I were recently discussing the awkwardness of telling people what happened, how we feel we must reassure them after they say, “Oh, I’m so sorry” with dismay, maybe a little horror. Sorry to have upset them we answer, “No, it’s okay, really!” And of course, that’s a weird thing to say – it’s not okay and it was terrible, and it’s still sad. But we remember how frightened we were as addiction swallowed him. Our day-to-day lives were so unstable and his behavior so erratic, that we could not help but feel released from a terrible insanity. We have made our peace and now, we remember mostly the good. Ten years of healthy love and a peaceful home have given us that grace. The anger gripping me for years has been replaced by forgiveness and a desire to understand what damaged him. His military experience – about which he was uncharacteristically mum? Surely almost 20 years of cocaine use destroyed much of his brain, but I am certain he was self-medicating – for what? Every mental health professional he encountered failed him – and us. Even as the years pass, I want to understand what destroyed this good man. As I look at photos, I remember the early days when I first met him in that crazy war zone. 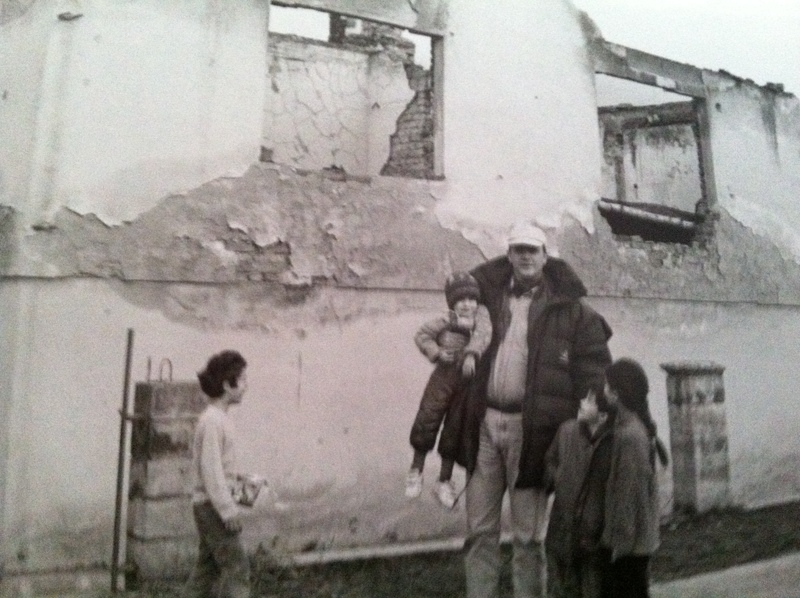 There he is standing amidst the ruins in Bosnia, making children laugh. Wasn’t he handsome? His personality filled the room, always the center of attention, he made sure of that with well-told (if rude) jokes and crazy antics. What amends was he making, what demons were kept at bay as he helped to save rather than to kill people in a terrible war? Being in this role in the center of constant crisis worked like a fix for him for awhile. 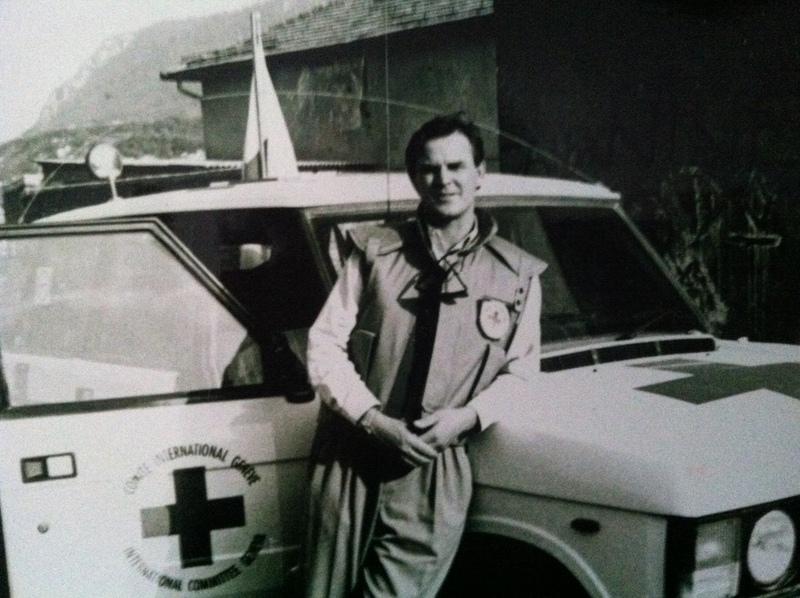 He thrived on what traumatized me, seizing every opportunity to save someone – and in doing so, for those years, he saved himself. He was at his best there. I am glad for the grace of ten years – to feel a simple sadness, for the chance to remember him so, on a date I can never forget. This entry was posted in Grief and Healing and tagged Addiction, Grief, healing, suicide, war. Bookmark the permalink. Maybe his inner turmoil mirrored the outer war zone and therefore he felt at home. Even we alcoholics / addicts aren’t sure at what drives us when we are in the midst of our addiction. You could ask us what’s wrong, and it comes down to “I don’t really know”. or “I don’t fit in this earth” or something along those lines. It has taken me a few years to understand where everything fit, how things came at me, how it got so bad. And even then, there are doors that I am sure are still closed to me…eventually the light of love and examination will bear fruit. I am so sorry to hear about your husband, and can’t imagine what it has left for you and your family. I do know that darkness, as I was suicidal as well. It was the despair of unable to live with the drink and unable to live continuing drinking. How grey a zone is that? Horrible. That is where many addicts and alcoholics land before they decide to tragically end their lives. Anyway, I mourn as only I can – on the outside, not knowing you and your family, but understanding what he may have gone through. Or not. Sending warm vibes and prayers.